I love kong-namul (soy bean sprouts). (And I swear. On my list of blog resolutions is to figure out how to use hangeul since this romanisation business is driving me a bit nuts. I managed to do it on my iPhone and download Kakao Talk, so there’s hope for me yet.) 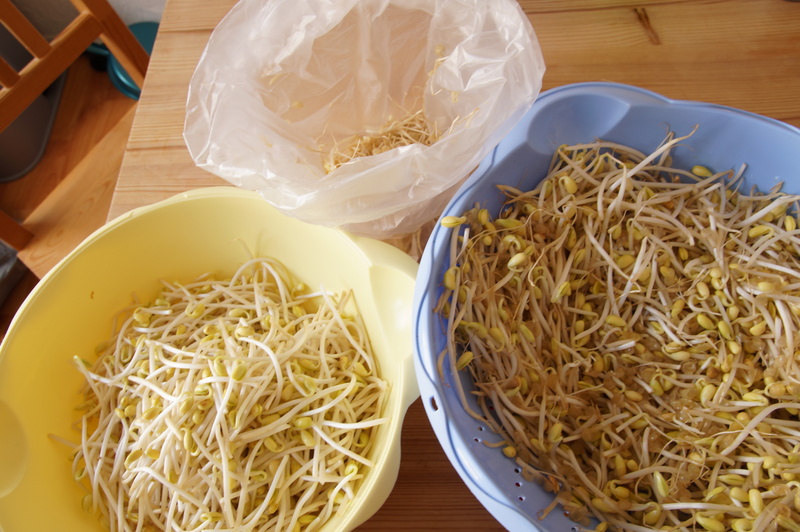 But speaking of driving me nuts, cleaning a bag of these sprouts is one of the most time consuming tasks. You have to pick every single skinny sprout, clean the ends and examine the head. (The best thing to do is buy the freshest bag you can find and cook it immediately.) There is gratification though. These sprouts boiled in anchovy broth topped with spring onions creates a soothing soup or else a surprisingly nutty and satisfying side dish or cover for steamed fish strewn with intense red chili flakes. Sometimes, I feel like life is like sorting through a bag of kong-namul. It’s full of the good, the bad and the ugly. Luckily, not so much ugly, just an occasional black sprout head. But, you still have to sift through it all to create your desired dish. I’ve been listening to cheesy Korean love ballads tonight in honor of Shin Hae Chul, the Korean pop star pioneer, who was one of the singers/main influencers of the soundtrack of my early adult life. I think this has put me in a sentimental, pseudo-poetic mood. And that’s why right now, I see life as a bag of kong-namul. Tags: agujjim, Jane, Jane and Johannes, kongnamul, kongnamul banchan, kongnamul guk, Korena love ballads, Kpop, Shin Hae Chul, soy bean sprouts. Bookmark the permalink.